Bring some southern charm into your dining room with our Old South Country Chair. This dining chair is Amish handcrafted in Holmes County, Ohio in your choice of a variety of hardwood and finish options. Relax in the beauty of handcrafted furniture. Our woodworkers are dedicated to providing you and your family with only the best they have to offer. You will be able to tell that no stone was left unturned in the construction of your chair. This dining chair looks perfect around our Amish Old South Country Dining Table. 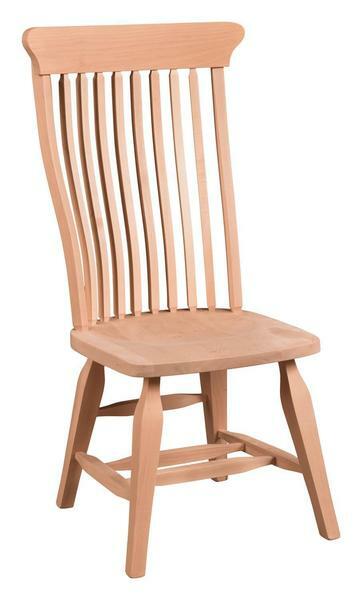 This Amish chair is shown in oak wood with a OCS 102 Stain. We also off our Old South Country Bench that would complement this chair flawlessly. Create a relaxing vibe in your space with the gorgeous Old South Country design. Get in touch by calling 866-272-6773 to speak with a friendly Amish furniture expert. Our team would love to be of assistance as your vision comes to life.